What It’s About: Wallace Wooley (Frederic March) is an up and coming politician who’s about to marry the wrong woman (Susan Hayward), thanks to a curse placed on his family in 1672 by two witches his ancestor burned at the stake. When a lightning bolt frees the spirits of Jennifer (Veronica Lake) and her father Daniel (Cecil Kellaway), Jennifer takes a personal interest in ruining the latest Wooley’s life…only even the plans of spirits sometimes go wrong…. Why Watch it Today? : Governor William Phips signed the order that ended the Salem Witch Trials on this date in 1692. 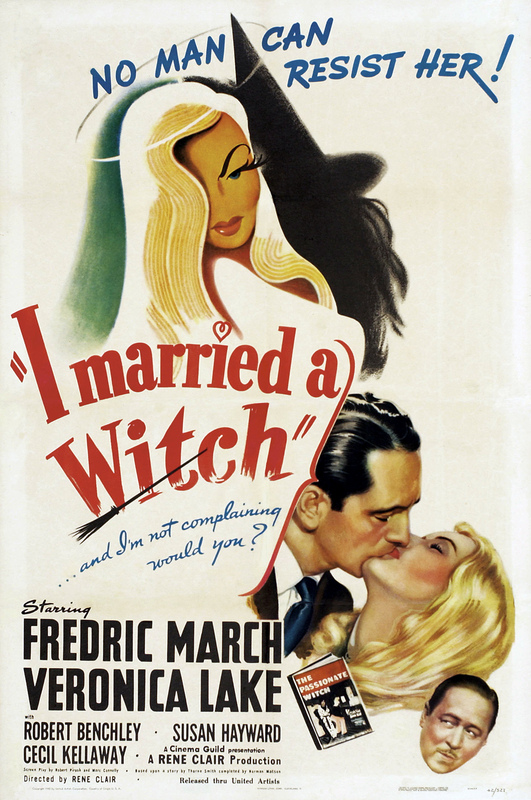 While I Married a Witch is not a good history of the affair (for starters, none of the accused were burned, they were hung or pressed to death, and it didn’t happen in 1672), it is a seasonally appropriate fantasy/screwball comedy, with Lake at her most appealing. This entry was posted in Black and White, Comedy, Fantasy, Independent, Movie of the Day, Romance, Screwball, The Original, Witches and tagged "lightning ressurects the dead", Best Score Nominee, burned at the stake, Cecil Kellaway, cranky ghost, curse, family curse, father, father-daughter relationship, fiance, flashback, Frederic March, interrupted wedding, light, love potion, love triangle, politician, Preston Sturges, Puritans, Rene Clair, Salem, Salem Witch Trials, shrew, United Artists, Veronica Lake, wedding, wedding night, witch.